One of the biggest misconceptions I've heard from salmon anglers over the decades is that most of them relate sunlight as being bad for catching salmon. The reality of this is that the presence of sunlight can often be a 'polar opposite' of that misconception if you apply a bit of good old common sense to your thought processes. In salmon fishing I would choose a high pressure bright light day over a low pressure dull light day any day of the week as I relate the vast majority of early Spring salmon captures I've been involved with to higher pressure days with the presence of sunlight. At this time of the year where you have freezing cold weather the sun can often just warm the surface layer of the river up enough to get Spring salmon moving and in the mood for a fly. Apart from being useful for camouflage security from any predator that's hunting salmon from above I'm fairly sure God created the dark back colour of a salmon to also act as a cold water condition heat absorber. The reason I say that is because obviously dark colours absorb heat and light colours reflect heat so in freezing water conditions when the river is running very cold a salmon can draw that warmth from sunlight if it positions itself high in the water column which is exactly where you'll find salmon when Jack Frost has been around! On so many occasions I've seen the fly rod nearly getting launched out of the stern of the boat when I was on the Tay and harling a high water column tube fly through the early months of the year. On the vast majority of these occasions it was during or shortly after the appearance of direct sunlight which I always found too much of a coincidence. In addition to that a salmon fly with some sparkly additions would truly 'light up' and go into 'flicker' mode with the presence of sunlight that a sunless sky could never achieve. Even through late Spring when the river starts to warm I'd still see more salmon caught on the brighter days and on the Tay the sun positioning in the sky for most beats would mean that it was directly shining up river in the angler's eyes for most of the day and not in the salmon's eyes. So check the angle of glare on whichever river you're fishing on and work out whether very bright light is really going to make a resident salmon hold deeper in the pool or not. Also be aware that most running fish that momentarily stop in a pool will be holding fairly high in the water column with or without the presence of sunlight. 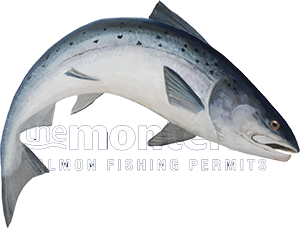 When the river warms up during late Spring and Summer which naturally coincides with a higher sky sun position 'resident' salmon will hold deeper in the pools for two reasons. The main reason will be temperature based as the cooler water is down deep at the bottom of the pool and the higher sun positioning 'glare' will be less comfortable for a fish by comparison to the lower sky sun positioning of early Spring. When salmon take that deeper holding position it's just the same for them as it would be for us putting a pair of Ray Bans on as the natural colouration of the river acts as a bright light filter. When you get resident salmon holding deep like that during late Spring & Summer the most effective way to catch them is to throw the rule book right out of the window. What I mean by that is the books generally tell you that a floating line is the way to deal with the warmer water conditions which will work with a really keen fish that's willing to come up several feet to intercept a fly in a medium depth pool. Most salmon however will not do that when they're lying deep so a very long and fast sink tip and and big mend to get the salmon fly right down onto them is always going to be the more logical approach. I recall a fine 12 pounder I hooked on the River Tay for a guest in bright light conditions with that very deep swim salmon fly tactic after everyone and their dog had been through the pool with zero success on an exceptionally bright light late Summer day.